MailDetective for Exchange Server is a powerful monitoring application designed to effectively control email use in the corporate network. It is a great solution against frivolous employees who undermine corporate discipline and decrease productivity by sending and receiving non-work related emails. It can also help reduce the damage from the bandwidth misuse which costs companies millions dollars a year. MailDetective, as an e-mail monitoring tool, has already gained great popularity among the companies using Microsoft Exchange Server. 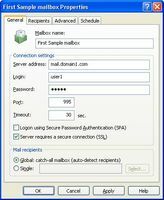 It was acknowledged in January 2006 when MailDetective became a second runner up in the Reporting category of the MSExchange.org Readers? Choice Awards. 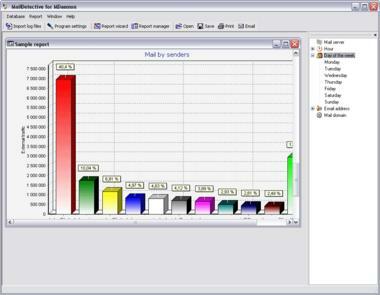 Today MailDetective for Exchange Server brings even more opportunities. Now you can work with several servers using one MailDetective installation. MailDetective for Exchange Server also offers support for Microsoft SQL Server. One more useful new feature is letter subject reporting, including substring search. MailDetective for Exchange Server analyses mail server log files and provides the employer with detailed reports about private and business emails coming to and from the corporate network as well as traffic distribution by users and email addresses. You can instantly see the information about email use in the entire company, by particular employees or during specific time intervals. These reports have a well-defined layout, deliver information in a clear, eye-pleasing way and can be saved either in HTML or Excel format. A typical mail-by-recipients report contains such categories as email addresses of senders, local email traffic, external email traffic and traffic ratio. With such reports, you can easily monitor email traffic generated by your employees, expose non-work related emails and stop abusers.